Range Rover Sport Performance, Engine, Ride, Handling | What Car? We have yet to sample the entry-level 2.0-litre four-cylinder petrol (Si4), but we have been impressed by its performance in the smaller Range Rover Velar. The plug-in hybrid P400e variant combines the Si4's 296bhp petrol engine with a 114bhp electric motor, and gives a healthy blast of acceleration when you put your foot down – albeit not quite enough to match the equivalent Volvo XC90 T8. It can also feel a little sluggish pulling away on full throttle – but the P400e will run on electric power alone for up to a claimed 31 miles (about 20 miles in the real world) and at speeds of up to 85mph. The hybrid can’t match the 3.0-litre six-cylinder SDV6 diesel's performance, though. Indeed, the SDV6 has even more mid-rev shove, which masks the car’s considerable mass and makes it a better option if you plan to tow a heavy trailer. It’s true that rivals such as the Audi Q7 50 TDI and BMW X5 xDrive40d are a little faster, though. If you want an SUV with sparkling performance but without enormous fuel bills, the SDV8 could fit the bill. With a 4.4-litre diesel V8, this model is effortlessly quick and the engine responds consistently whenever you touch the accelerator. The 5.0-litre petrol V8 is extravagantly powerful, both in regular 518bhp form and 567bhp SVR guise. Indeed, the latter engine makes the Range Rover Sport a genuinely fast and exciting performance SUV. You’ll find yourself breathing a sigh of relief when you spot a national speed limit sign and can finally let it off the leash – the high-pitched wail of its supercharger and trumpeting exhaust fanfare accompanies its prodigious performance to intoxicating effect. That said, the frustratingly slow-witted automatic gearbox dulls the lustre of the experience. Most versions of the Range Rover Sport offer exemplary ride comfort, with high speed suppleness a particular virtue. That makes this a superb car in which to spend a long journey and, unlike in some luxury SUVs, you don’t have to fiddle with numerous system preferences to get the car into a comfortable mode. We would say, though, that the Audi Q7 has the edge on overall smoothness if you add the optional air suspension). The best-riding Range Rover Sports are those at the bottom of the range, with the smallest wheels. Entry-level HSE trim, for example, comes with 20in wheels whose deeper tyre sidewalls do more to absorb road surface imperfections. Higher-spec and higher-powered versions with 21in and 22in wheels are a little less supple over bumps, especially around town, but are still pretty comfortable. We also found the hybrid P400e to be rather firmer than conventionally powered models. 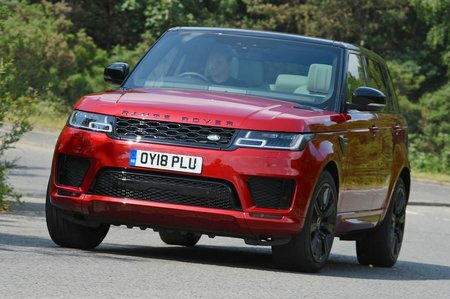 The SVR model – the only Range Rover Sport to be offered with performance road tyres to wrap its optional 22in wheels – has the stiffest ride of the line-up. It's more comfortable on the motorway than it is at lower speeds – it tends to thump over broken Tarmac in town. Every Range Rover Sport feels stable and relatively agile. It isn’t the most athletic SUV of its kind, nor is it one that feels smaller than it actually is, and some rivals also offer more grip and tighter body control. However, the Range Rover Sport is an easy car to drive along a twisty road, mostly thanks to the consistency of its controls. Every model apart from the SVR uses the same height-adjustable air suspension set-up, but entry-level HSE versions don’t have all the high-tech handling and off-road aids you get in more expensive variants. They can, though, be added at extra cost and are worth having if off-road prowess or on-road handling poise are high on your list of priorities. 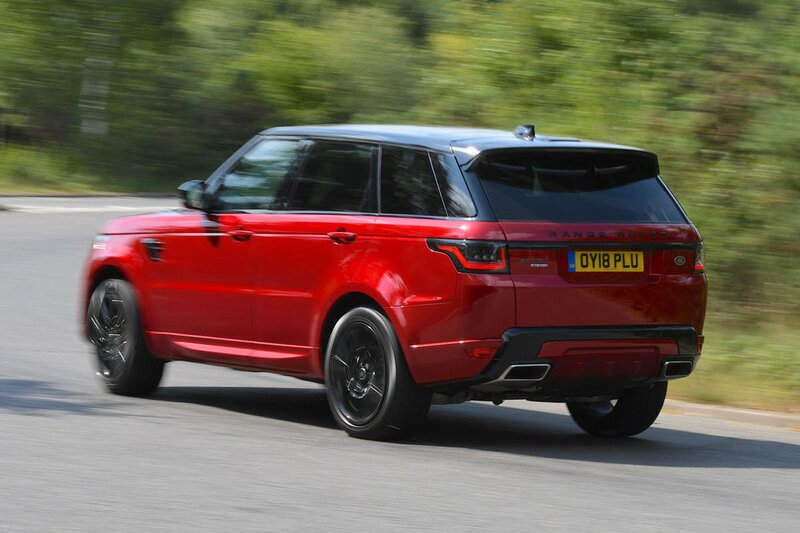 Unsurprisingly, the sharpest Range Rover Sport in the line-up is the range-topping SVR variant. In truth, it wouldn't see which way a Porsche Cayenne Turbo went down a challenging, twisty road, but, with its mischievously tail-happy nature, enthusiastic drivers will find there’s plenty of fun to be had behind the wheel of an SVR. In contrast, the P400e hybrid is the least impressive Sport in the bends. With a massive battery pack under the boot floor, extra weight at the back makes it feel much more ponderous in the corners. There’s some wind noise on the motorway – that’s inevitable for such a large, upright car – but the disturbance is limited to a gentle flutter around the door mirrors and front pillars. Versions on 20in wheels don’t suffer from much road noise, but you’ll notice rather more in cars fitted with 21in and 22in wheels. There’s little to choose between the equally impressively smooth and quiet SDV6 and the SDV8 when it comes to engine noise. Of course, nothing in the range beats the plug-in hybrid P400e for refinement when it's operating in electric-only mode, but its 2.0-litre petrol engine only remains quiet if you stick to lower revs. It can also prove a little clunky when switching between petrol and electric power. Both V8 petrol versions have muscular engines with loud soundtracks to match, with the SVR being especially thunderous. Though it is possible to drive them in a calm, muted manner, they cast aside any pretence of restraint as soon as you toe the accelerator. Still, both engines are set up for performance rather than quiet cruising opulence, and the aggressive soundtrack is arguably a big part of their appeal.